Scandal! Blackmail! Corruption! 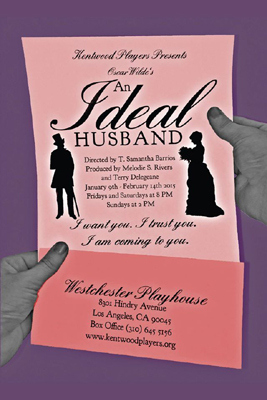 Oscar Wilde’s An Ideal Husband is a scathing satire of the British aristocracy filled to the brim with temptations, betrayals and secret liaisons. Sir Robert Chiltern, a brilliant politician and perfect gentleman, can do no wrong in the eyes of his charming wife Lady Chiltern. But when the calculating Mrs. Cheveley appears on the scene, Sir Robert’s marriage, reputation, and promising career are put at risk. With his world about to unravel, Sir Robert turns to his lifelong friend Lord Arthur Goring, the most eligible bachelor in town, to extricate him from the web of lies that seeks to undermine both his public and private honor. Lady Chiltern knows the true nature of Mrs. Cheveley. Lady Chiltern knows her husband, Sir Robert Chiltern, is beyond reproach. Mrs. Cheveley has a sinister proposition for Sir Robert Chiltern. Lord Goring never expected to see Mrs. Cheveley again after he narrowly escaped marrying her. Lady Chiltern knows her sister-in-law Mabel Chiltern entertains many suitors. Lady Chiltern and Sir Robert seem to have a perfect marriage. Lord Goring and Mabel Chiltern, who adores him. Lord Goring channels Oscar Wilde. Mrs. Cheveley ensnares Sir Robert in her swindling scheme. Photo by Terry Delegeane. Lady Chiltern and Sir Robert find their love put to the test. Photo by Terry Delegeane. Mrs. Cheveley attempts to ignite an old flame with Lord Goring. Photo by Terry Delegeane. Lord Goring dallies with, Mrs. Marchmont, and Lady Basildon. Photo by Terry Delegeane. Lord Goring offers his assistance to Lady Chiltern. Photo by Terry Delegeane.